George Wright is dead. He was not killed in battle, but was a victim of one of the many shells that fall on Ypres daily. He was walking down a street when a shell fell and killed him outright. He was a regular visitor to the OPS, attending three dinners before the war. His frequent visits are full of the most delightful memories and we will miss his cheery wit and humour. The shock to us is all the greater as George was engaged to be married and was here watching games on the School Field with his fiancée when on leave, just a week before he was killed. 2nd Lieut. 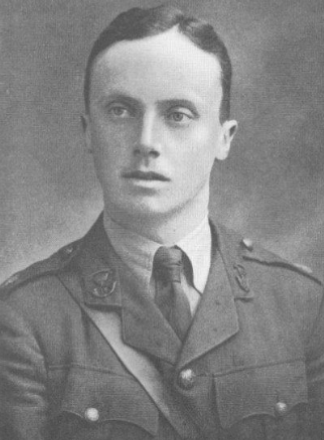 George Wright (Somerset Light Infantry) wrote to us last month – he went out to the Western Front in July 1915. 16/4/16 “How is the school going along? Oxford must be very different in war time. The school must be the least changed thing there. We are not having a very jolly time here, as we are in the wrong place for amusement as the musical accompaniment is too pronounced for my aesthetic ear. The weather is simply topping here now, blazing sun and not a cloud in the sky. Yesterday I had some splendid sport: we fished with bombs – that is to say we chucked bombs into the canal and then waited till the fish floated down to the next bridge. I’m afraid we should be ostracised for such an illegitimate type of sport in England, but perhaps we may be excused out here. You know, I rather envy the fellows out in the East in spite of their hardships. They do get a chance of some real open fighting instead of going into the same old trenches time after time. I’m afraid you will think this is a very ‘grousy’ letter. As a matter of fact, I am as cheery as anything. This old war has been absolutely the chance of a lifetime to most of us, and will be the making of such of us as come out intact. I think most people out here realise that they will never have another chance to make good like this. And there are extraordinarily few failures out here – and most of them are excusable. Mrs Grundy (mother of Leslie Grundy) has been instrumental in the organisation of the food for the 3rd South General Hospital, catering for several hundred patients. Mrs Poulton (mother of the late Ronald Poulton Palmer) is involved with the Union Jack Club, which provides time and place for mothers and wives of serving soldiers to meet and comfort each other. 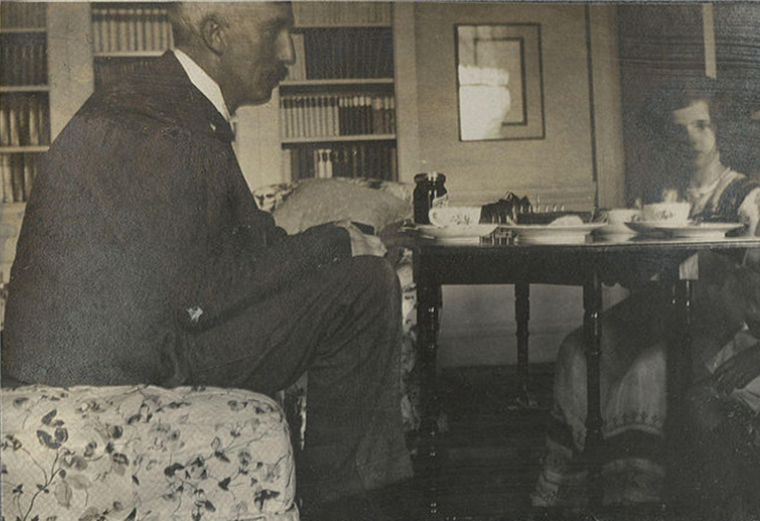 Lady Osler (whose son Revere Osler is with the RFA) has been organising a group making bandages and other medical necessities. Mrs Gamlen (mother of Jack Gamlen) started a branch of the Needlework Guild devoted to war work. Mrs Kingerlee (mother of Cyril & John Kingerlee) started the idea of having Flag days to raise money in Oxford to finance the war. Mrs Vinogradoff, whose son Igor has only just left the OPS (and is only the second Russian boy we have had in the school), is raising money for Russian POWs. Sir Walter Raleigh (father of Adrian Raleigh) who, apart from being Oxford’s Professor of English Literature, is prominent in the Oxford Volunteer Corps (sometimes referred to as ‘Godley’s Own’). Here is a delightful picture of him with Igor Vinodradoff’s mother. 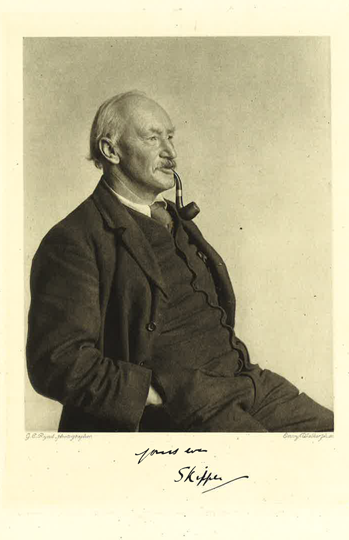 The picture is taken by Lady Ottoline Morrell, the wife of Philip Morrell, who was at the OPS (1878-80) and currently is the Liberal MP for Burnley. As for other changes, George might like to know that street lighting is almost non-existent and ‘Great Tom’ at Christ Church has been silenced for the duration.